Huge Strong Hammering With 10 Seconds Ad, Massive 200 Repetitions Per Day, 7 Days Ad campaign. Flat 66% Off for First 5 Clients. Strictly On First Come, First Serve Basis. Take The Live Experience Of This Unique Synergistic Medium. Watch The Video. Know More About The 2 BIG LED Screens By Downloading The Presentation Here. 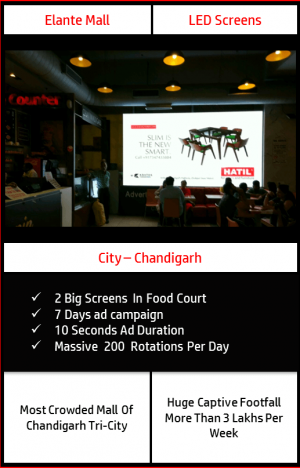 Massive Captive Audience Footfall Of More Than 12.5 Lakhs People Per Month. Highly Recommended Package By BMK Ensuring Grand ROI. 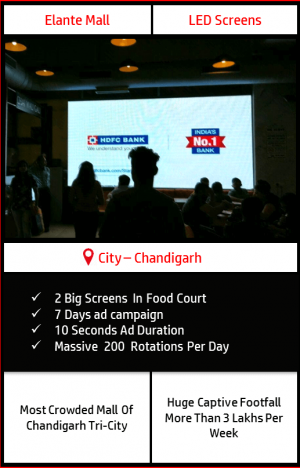 The 2 BIG LED Screens in Food Court is a cherry on the cake which takes entertainment for the crowd coming to the next level. The mall witness a mammoth footfall every day which keeps the development the most happening place in the Tri – city . Hence, all in all a must preferred location for the advertisers seeking to cater a huge crowd to give their brand a grand visibility. Total Crowd: More Than 12.5 Lacs people per month. More Than 9 lacs people per month is the Captive Audience Crowd which spends at least 1 hour sitting while having their meals. Hence, ZERO AD AVOIDANCE. 2 Gigantic LED Screens are so strategically located that it covers each and every nook & corner producing a SYNERGISTIC EFFECT i.e. 1+1 = 11 times more mileage. Huge Brand Recall (High visual repetitions while people having their leisure time, gives a huge brand recall). High ROI (Best among all media in town). Highly rich & engaging content keeps people entertaining all the time. 200 Slots of 10 seconds will run on both the screens combined per day i.e. Total 100 slots of 10 seconds would run each day on each screen. The Client/Service Provider undertakes and warrants that the booking commitments shall not be postponed or cancelled without mutual consent of the parties. Campaign once locked can’t be stopped in between and the media taken can’t be changed or cancelled.